Time-Warner Milwaukee / Roadrunner Problem May Finally Be Fixed…? It’s still too early to say with any kind of certainty, but according to the folks at the Southridge Time-Warner retail store location, it might be. 820 lost packets, 57% packet loss. In an hour. Booyah! So I went into the retail location tonight, nervous about blowing up at people there, because, as I’ve explained before, a person can only endure so much and calmly explain a complex problem so many times with sufficient detail to make the true horror of the situation clear before that person simply…can’t anymore. All in all, I think I handled myself a lot better than I imagined I would….so that’s good. Am I totally pleased with the outcome? Not really. I’ll explain. First, I want to thank the people there at the Southridge store–Selenthia and Julia in particular, as they were the ones that worked with me and discussed the situation with me. So thank you to the two of you specifically and to the rest of the staff–including the New Guy I probably scared a little initially, sorry! I launched into explaining my issue and was quickly told that they had received a memo about the Turbo service (which we’ve had continuously in its various forms since December 2006) not being compatible with Motorola Surfboard cable modems SB4100 and SB4200. Take a guess what models we’ve had most of the last year and a half. Yep, SB4100/4200s. We had an SB4200 when this whole situation blew up in December 2006 (boy, doesn’t that date sound familiar…) for the first time, and we swapped it out–numerous times–and ended up with an SB4100 each time after that. I don’t recall ever getting another SB4200 in exchange, and I know we never got anything newer than that. The problem is that they got this memo, according to Selenthia, about a month and a half ago. How hard would it be, really, to notify SB4100/4200 users on Turbo? I was told “they should have notified you”, but I have no idea how or when that might have happened. I don’t recall it showing up on any statements, but we’ll be double-checking that. Now, we’ve been saying since the very beginning that it seemed awfully coincidental that all of these problems started shortly after switching/upgrading to the “Turbo” service in December 2006. We have mentioned this to every person we’ve ever talked to about this problem as a possible reason for the issue. We were blown off by everyone. And here we are, almost a year and a half later, and we were right all along. But no one from Time-Warner / Roadrunner could be bothered to even seriously consider it. Julia, apparently one of the store managers, worked with me to credit our bill for the recent troubles, but as nice and as helpful as she was, as far as the total effort put forth by Time-Warner Milwaukee / Roadrunner The Giant Faceless Company is concerned, it’s just not enough. We put up with most last year being told the problem was ours. That the problem was our house, our computers, televisions, Tivos, our neighbors, and on and on. No one ever accepted or investigated the possibility that the problem was on the TW side of the pole. Ever. We were blown off by almost every single TW/RR person we ever communicated with. So we wasted–completely, totally wasted–entire man-weeks of time reconfiguring our network, moving wiring, moving machines, changing out hardware, driving back and forth swapping out modems, sitting in call queues getting the runaround, putting up with incompetent technicians, gutting and changing every device configuration and setup we have…logging and tracking reboots for hours and hours and days and days, totally frustrated. Unable to do anything online. No work. No fun. Nothing. All the things Time-Warner techs and engineers should have been doing, as the problem became increasingly, obviously Not In Our House Anywhere…we were essentially forced to do ourselves. No one else was going to do it! Much of this effort and frustration is reflected in posts presented here on this site. It has been PAINFUL, exhausting, frustrating, and created so much anger. It has cost us so much in so many ways. Julia told me she would be passing my business card–which has this website’s address on it–on to her superiors. We hope someone in the higher echelons of Time-Warner Milwaukee / Roadrunner takes the time to come here, reads about all we’ve endured, and does The Right Thing. We want a solid, public apology from someone In Charge. Not some slick handshake from a sales or marketing drone, not some PR person or anyone else programmed to lie and tell people what they want to hear. No form letters. We want a sincere, honest gesture made to us for all of the crap and pain and tears and work we’ve endured, all the business and social losses. All the work Time-Warner should have been doing all along. All the effort that was never made to help us. For nearly a year and a half, all told. It’s the very least they can do. More would be even better. What else can Time-Warner / Roadrunner do? Start monitoring comments online, for starters. Even basic searches will quickly lead you back to this very website. Comcast is monitoring online communications and social networks like Twitter. Time Warner / Roadrunner is, ironically, apparently really bad at being online citizens and monitoring that space for opportunities to improve. They could really be connecting with their customers more quickly and more positively, and word-of-mouth effects from such encounters would dramatically improve the perception of their interest and their brand, increase customer loyalty, and drive new business. But even before that, listen to your customers. However they come to you. Take them seriously. Do not tell them the problem is theirs if there’s any chance it is not. Give them some benefit of the doubt. Follow up on promises, too. If you say you’re going to call back, call back. This is incredibly basic, fundamental stuff! Don’t let yourselves get so big or caught up thinking you’re so big that even one customer doesn’t matter. Word of mouth–especially now with the Internet–is incredibly powerful. Use it to your advantage! We’re told the fix is a newer-model cable modem. Go figure. So we were given a Motorola SB5100 that’s supposed to work and correct everything. That said, we’ll definitely continue to track our connection and log all details until we’re satisfied this actually fixes the problem. We’ll be running speed tests, doing download tests, and verifying stability, reliability, and speed. We’ll definitely be raising more hell if this still isn’t resolved; there are plenty of places yet to shout and get people looking more closely at this. And in the meantime, Time-Warner Corporate, we await your review of the entirety of our long-running nightmare and an appropriate return gesture by you for all the hell you put us through. And when you’re done with us, look around a little, refocus, and start helping all the others out there that need you, too. This entire ordeal with you guys has been just terrible. It’s gone on for soooo long, and I know it’s been really hard on you guys with your toddler and new baby, too. It’s unfathomable, frankly, that companies can act this way and be so irresponsible. You really should still consider an FCC complaint at the very least, if not local-media “consumer affairs”-variety coverage of your issue. And don’t forget your state’s Attorney General’s office. Here’s to hoping that the new cablemodem fixes you up, and that TW gets their act together. They OWE you, BIG TIME. Back when I used to support cable TV and Internet (never ever again) one customer told me that he called Motorola about his problems with his surfboard (4100 or 4200 I forget which one) and Motorola exchanged the unit for a new unit. This was somewhat humorous given that the customer did not own the modem, the company I worked for did – hah! The best modems out there are the Toshiba modems (they quit making them), surfboards (not 4100 / 4200) and the ZyXEL modem P971 (good luck getting one). You can buy a quality modem and not have to pay for modem rental. @Cloud: Thanks a lot for stopping by and taking time to comment. I have always been of the understanding that Time Warner (at least here) will indeed let me purchase my own cable modem and use it, but they don’t give any sort of credit or discount because they don’t bill modem rental separately. I had alot of problems with my modem a few months back and they replaced my surfboard with a Terayon TJ715x. You should see if you can get one of these. I haven’t had a problem since. Time Warner//Road Runner customer services are just horrid. Called them up to get a new cable modem. In order to simplify the process, I tried to get the help desk person(s) to read your website http://www.alexfalkenberg.com. @Steve: Thanks for stopping by; I appreciate the feedback. I was only offered the Motorola Surfboard 5100, which so far seems to be working, at least as far as the reboots are concerned. I’m certainly interested in learning which of the two is generally preferable relative to each other. I’ve had two reboots since the 5100 was swapped in–one at 3am for about 10 mins (iirc) and another a few hours later that lasted nearly an hour. We’ve not done any serious testing yet, but plan to. We did download a couple of Linux ISOs that first night, as a quickie test. During that time, no reboots, and while speeds were noticeably better, they’re not really up where we think they’re should be (hovering around 10Mbps instead of closer to the 15Mbps that’s advertised; and yeah, we know 15Mbps is not always possible). @Norb: Thanks for commenting, and we hope your stuff gets fixed. You’re apparently right about the fix memo and who does/doesn’t know about it; I’ve been following this situation very closely online for a LONG time, and haven’t seen any mention anywhere about it. If it’s been published/public knowledge for a month and a half or so already (as I was told), you’d think SOMEONE would get around to mentioning it online SOMEWHERE. Maybe I just haven’t stumbled across it yet, I don’t know; I’m certainly not infallible. UPDATE: I did find some mention of people getting newer cable modems and having issues improve, but I’ve not seen any mention of any TW employee confirming it being a CM issue “officially”. It really does seem like they’re waiting for people to notice things are broken; most people, if they have the problem we’ve had, probably won’t. And Time-Warner is notoriously, shamelessly insistent on blaming the customer (house, wiring, equipment, etc) instead of taking responsibility, so most customers that DO notice will either believe, or be led to believe, it’s their fault somewhere, somehow, anyway. I’ve literally heard every possible excuse why this has been OUR fault over the last year and a half. Very frustrating. You can go to a local TW store/office and swap out your cable modem anytime at no charge, by the way–assuming they provided it. I was told people should “ask for a black one”, which the SB 5100 is, and I’m assuming the Terayon model @Steve mentioned is as well (but I don’t know, yet). Good luck to you, again. Looking forward to hearing from you again after your next encounter(s). Wow, I would be absolutely furious too. I really do sympathize with your situation but I’m in Milwaukee also and subscribe to Turbo but yet haven’t had any issues. We’ve had it since they started it and our service has been impeccable. I always highly recommend TW and RR to whoever asks. I certainly hope that all your problems are solved now and you get the compensation due to you. Good luck! We have the same issues with TW in Round Rock, Texas as well. 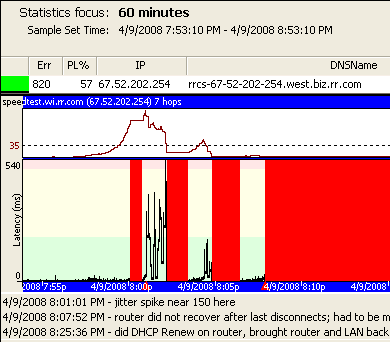 We lose connection and go through a modem reboot about 3-5 times a day. 6 tech visits and multiple phone calls to customer support with a different excuse each time; solar flares, mis-wiring, user error, bad modem, sub station issue, etc, etc.